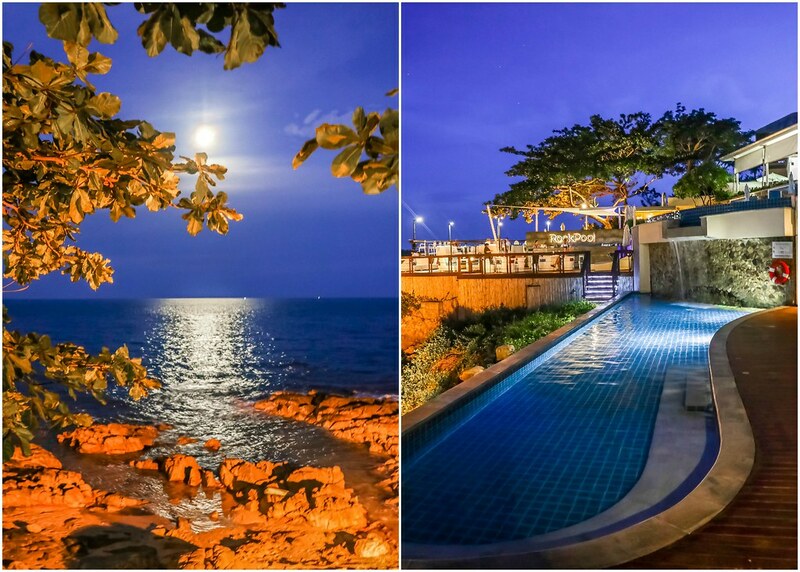 Besides offering lush amenities and modern comfort to meet the needs of vacationers, the Kanda Pool Villas also has a hidden culinary gem which exceeded my expectations – the Rock Pool Restaurant and Bar. Helming the kitchen is Executive Chef Lisa. 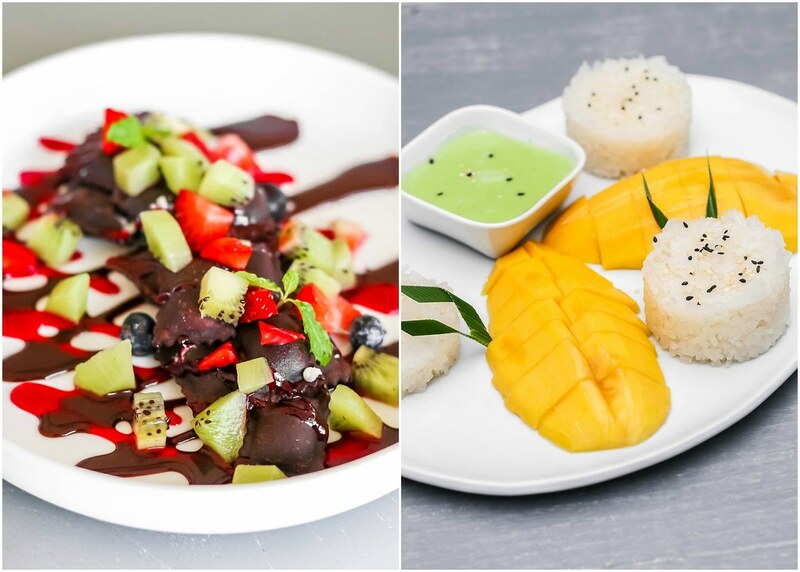 Born and raised in South Africa, Chef Lisa brought along her knowledge and cooking techniques to Koh Samui. She’s really good at whipping up delicious western cuisine with an Asian twist. The well balanced menu she designed is a true reflection of the relaxed resort atmosphere. Having dinner at the restaurant’s multi-level deck boasting a panoramic ocean view before ending the evening with a stroll along the beach is highly recommended. 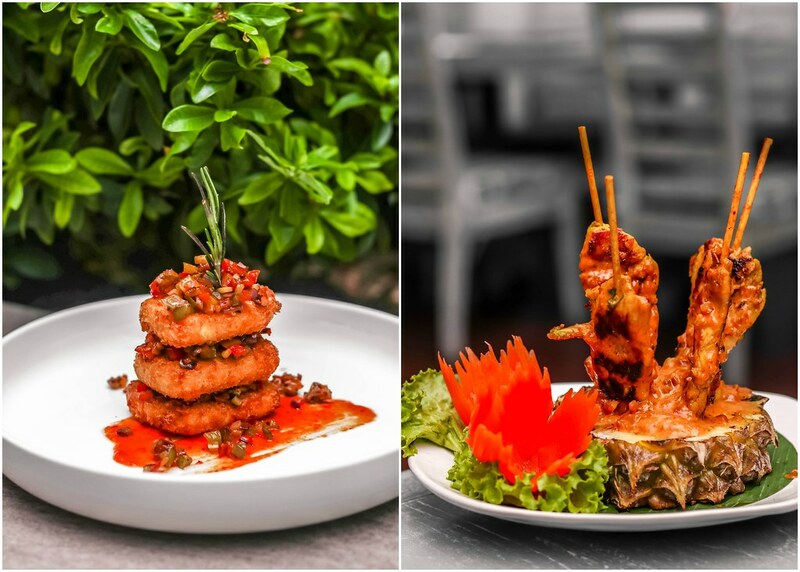 Begin with starters like the Fresh French Oysters (1/2 dozen 555baht / 1 dozen 999baht), the Chicken Satay on grilled pineapple (250baht), the Fried Halloumi Cheese with red pepper and sautéed vegetables (380baht), and more. 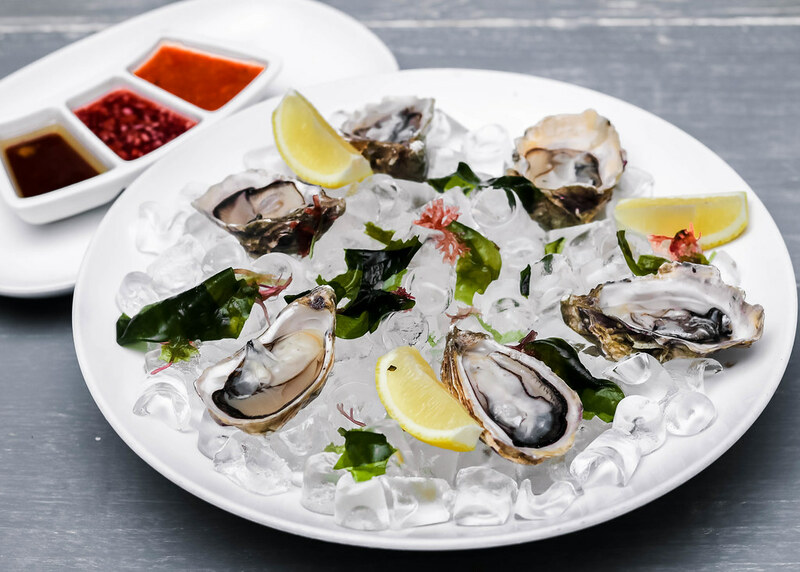 The oysters taste briny, and as compared to the commonly found Canadian oysters and Pacific oysters, the French ones really “slap” you awake when the taste hits your tongue. If you find the taste of the oysters too overwhelming, just pop a piece of fried Halloumi cheese to balance it out. The huge chunks of chicken satay are tender and boast a little smokiness without being too greasy. The in-house made satay sauce drenched generously over the chicken skewers paired with the pineapple resulted in a sweet and fruity tanginess. What a wonderful combination! 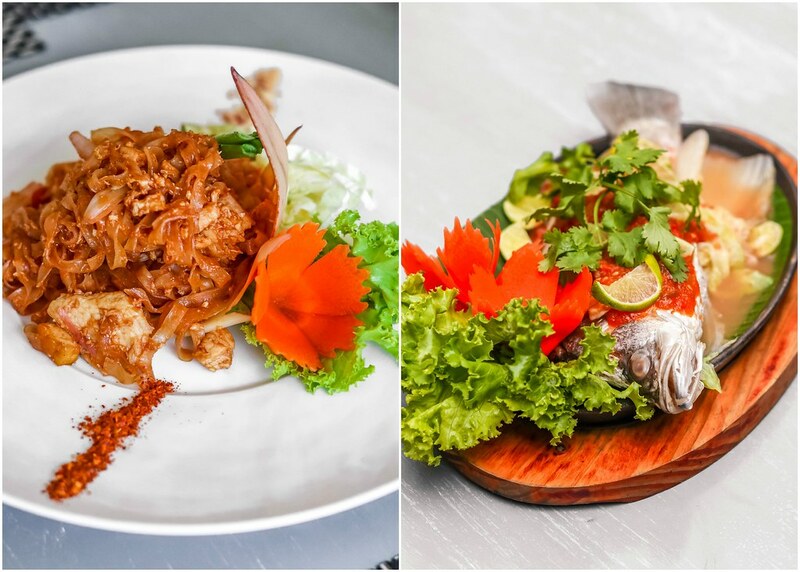 As for the mains, you can choose from a variety of pastas, pizzas, grilled meats, seafood options, and Thai fusion dishes. 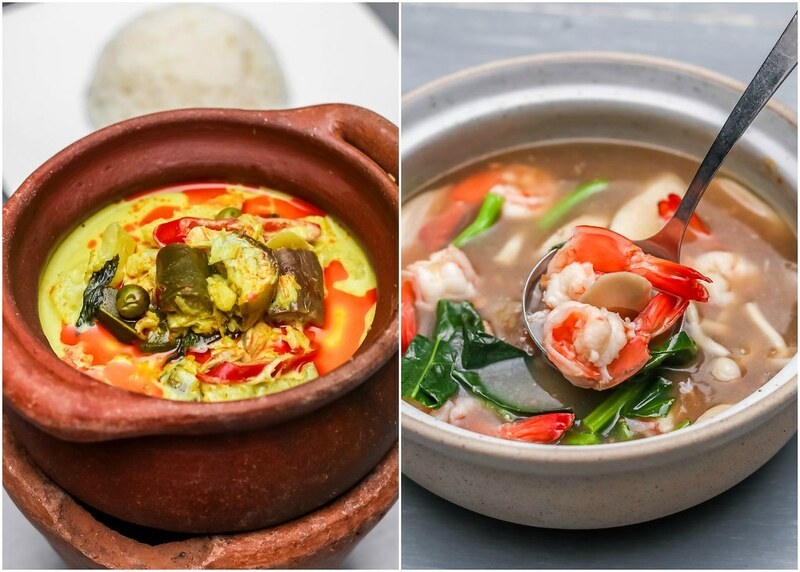 Pad Thai, Green Curry and Tomyum in clear soup are available. I enjoy the sea bass prepared with tomato puree, tomato confi, green peppercorn, and black olive powder the most. Chef Lisa deboned the sea bass so well, and it is very fresh and meaty. The hint of peppery kick from the marinade completes the dish. Seafood lovers, rejoice! Two whole Canadian lobster grilled with garlic and herb butter, stir fried tiger prawns, two whole swimmer crab in yellow curry, whole fish in three flavours sauce, stir fried squid in sweet sauce, vegetable fried rice, fresh fruit plate and a bottle of sparkling wine cost 5,500baht per couple. This set requires 24 hours’ advance booking. It is great for those who are celebrating a special occasion. Chef Lisa has a creative mind and thinks out of the box. Besides coming up with the unique sea bass dish, she has curated a dessert menu that includes deep fried chocolate ravioli. The pasta is filled with a sweet mascarpone cheese before deep-frying. It is drizzled with a rich chocolate ganache and served with strawberries, blueberries and kiwi. If your taste buds are not feeling too adventurous, simply go for the classic Thai mango sticky rice dessert. Aside from Japanese cuisine, I’m also fond of Thai cuisine, and Chef Lisa has managed to satisfy all my Thai cravings over the four days that I stayed at the Kanda Pool Villas. 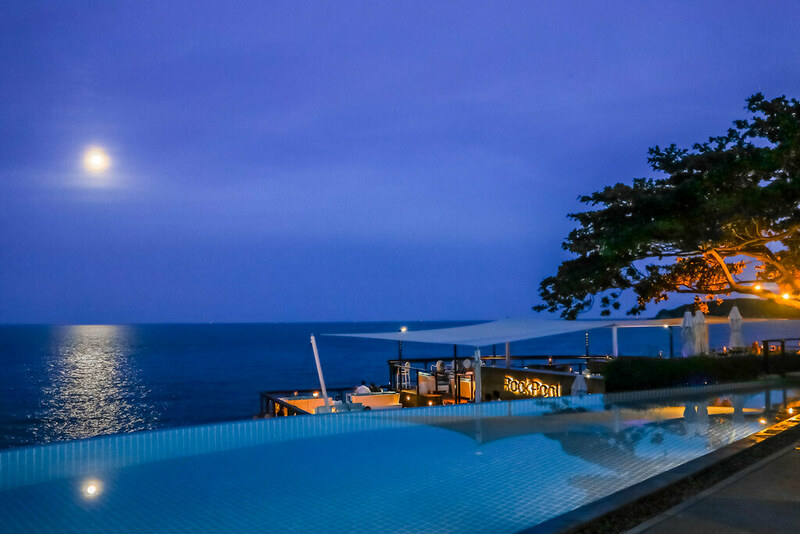 Even if you are holidaying in Koh Samui but not staying at the Kanda Pool Villas, you should squeeze out an evening for dinner at the Rock Pool Restaurant and Bar. Opening Hours: 7am to 10pm (food service). 7am to 10.30pm (bar service). Note that this is an invited tasting. Hi, thank you so much for your feedback and for following my adventures!